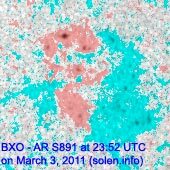 Last major update issued on March 4, 2011 at 05:45 UTC. The geomagnetic field was quiet to active on March 3 under the influence of a high speed stream from CH438. 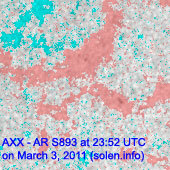 Solar flux measured at 20h UTC on 2.8 GHz was 120.9 (increasing 38.8 over the last solar rotation). 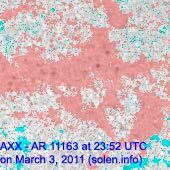 The planetary A index was 12 (STAR Ap - based on the mean of three hour interval ap indices: 12.5). 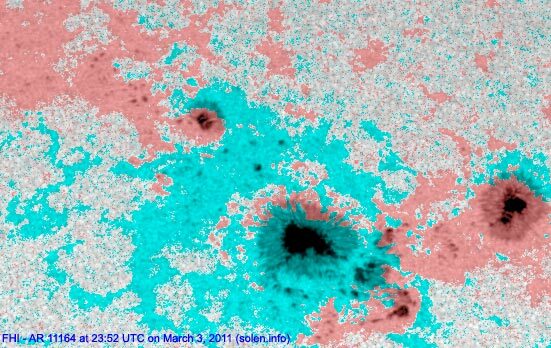 Three hour interval K indices: 33423233 (planetary), 33432233 (Boulder). Region 11163 was quiet and stable. 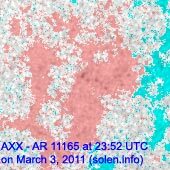 Region 11164 still does not exhibit a complex magnetic layout, however, an increase in flare activity late in the day is interesting. 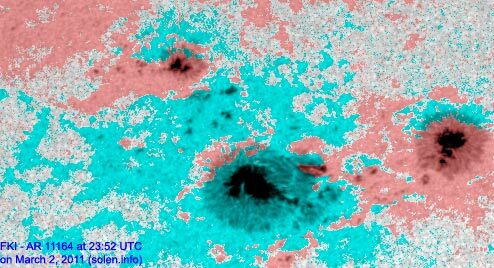 The largest penumbra lost some area as several spots split off in the western part. A major flare is possible. 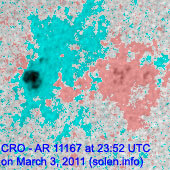 Flares: C1.2 at 11:34, C5.4/1N at 14:19, C1.2 at 19:36, C2.7 at 20:50, C2.0 at 23:34 and C2.1 at 23:58 UTC. Region 11165 decayed further and could soon become spotless. 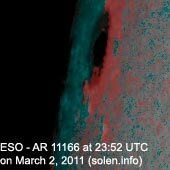 Region 11166 was mostly quiet but should be capable of producing an M class flare. 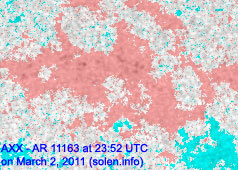 New region 11167 emerged in the northeast quadrant on March 2 and was numbered by NOAA/SWPC the next day. 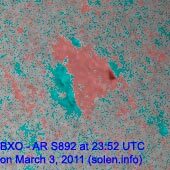 [S891] This region emerged in the southwest quadrant on March 3. Location at midnight: S17W27. 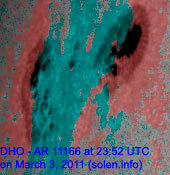 March 1-2: No obviously Earth directed CMEs were observed in LASCO and STEREO imagery. 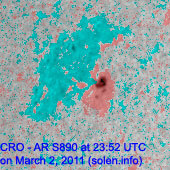 March 3: A partial halo CME was observed in LASCO and STEREO images after 05:30. 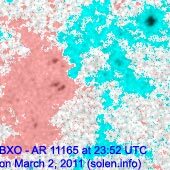 There was no apparent filament eruption and the source of this CME appears to have been to the southeast of the center of the visible disk. 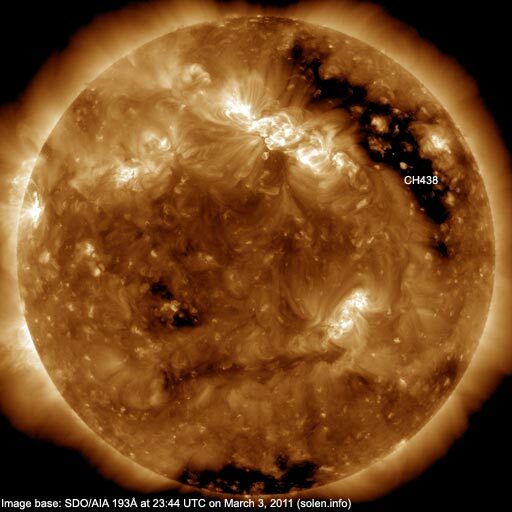 No significant coronal holes are currently in or near an Earth facing position. The geomagnetic field is expected to be quiet to unsettled on March 4 due to effects from CH438, isolated active intervals are possible. Quiet conditions are likely on March 5. 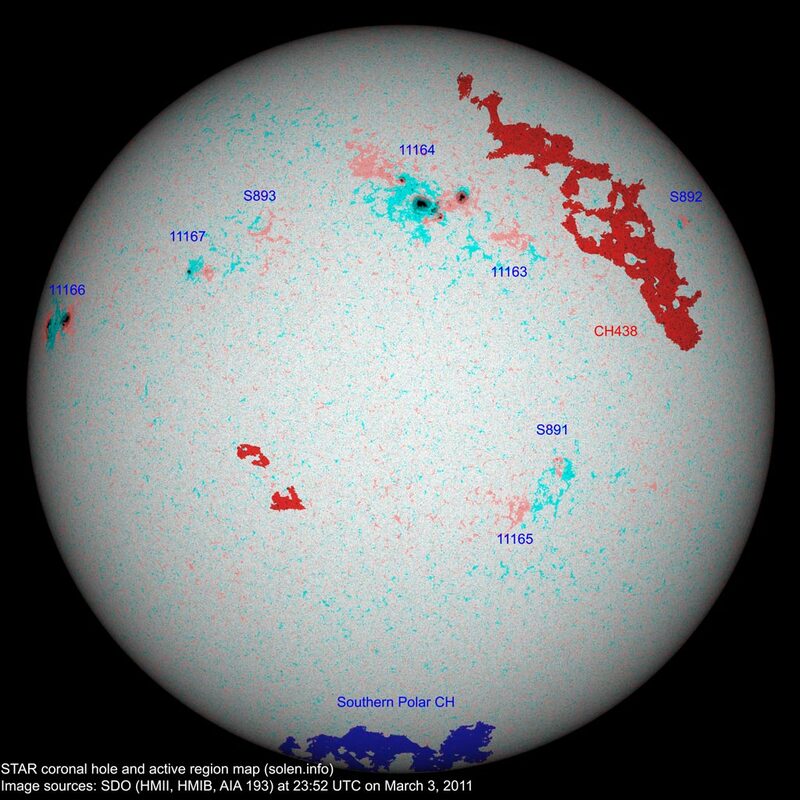 On March 6 or 7 there is a chance the CME observed on March 3 will cause some unsettled and active intervals.